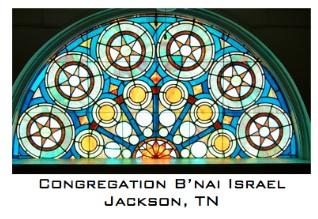 Congregation B’nai Israel is one of the oldest reform congregations in West Tennessee. Leaders of the congregation are certain that there was a small congregation in Jackson prior to 1885. Tombstone inscriptions in the old cemetery on Madison Street show dates prior to 1875. All the remains were moved to the new cemetery on Hollywood Drive, then called Neeley Street. The Jackson Jewish community has a long and rich history with the first congregation being formed in the mid-1850s. d n english, a local historian, has found through her research that when Jackson was incorporated in 1824, there were already Jews living in the “West Tennessee Territory,” which is what the area was called previously. By 1825, Jews living in Jackson were listed in the local records. In other words, Jews have been living in this area since before there was a Jackson, Tennessee. In 1885 the religious needs of the Jewish community were such that they required a place to meet and worship together. President J. Friedlob, Secretary Victor J. Woerner, and Trustees Henry Myers and Nathan Baum applied for a charter to establish a congregation. A charter was granted on May 14, 1885. They first met in the homes of some of the members – Mrs. Rosenthal at 180 Highland and Nathan Baum, Mr. and Mrs. Phillip Marks, Mr. and Mrs. Louis Marks, all of whom lived on West Deaderick. They also met in the hall above M. Tuchfeld’s store at 107 North Market Street, which eventually became Kisber’s Department Store. The congregation had originally purchased a lot on North Cumberland Street for $500 in July of 1885. A lack of funds, however, prevented them from construction of a building. Finally, in June of 1897, they traded the lot, plus an additional $600, for the Cumberland Presbyterian Church’s building on College Street. The dedication service was conducted in 1897 by Rabbi M. Samfield of Memphis. This was their place of worship until 1941. In 1924, under President Joe Rosenbloom, a new building fund was established. With sufficient funds in hand, ground was broken for the new building at the corner of West Grand and Campbell Streets in April of 1941. This was due in large part to the then President A.S. Lindy and his co-chairmen Sam D. Rosenbloom and Jonas Kisber, Sr. The architect was Carl Heyer of Memphis and the contractor was Hubert Owen of Jackson. 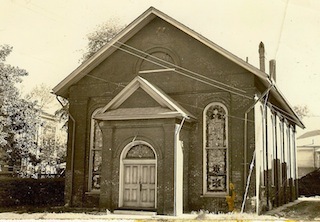 The corner stone was laid on August 24, 1941, and the first service held in the new building was on Rosh Hashanah Eve, September 12, 1941. The pews, removed from the Cumberland Presbyterian Church building, are still in use at the temple. The new building was dedicated in May of 1942, with Rabbi Louis Binstock of Chicago, who had served B’nai Israel as a student rabbi, as the guest speaker. There was great public interest in the event and Rabbi Binstock’s remarks were broadcast live over local radio. Classrooms were added to the building in 1962. In 2008, the building was added to the National Register of Historic Places. Several members of the congregation have held places of honor in the commercial, civic, and fraternal life of the city. Alfred Besinger, J.C. Fesenthal, and Lewis Englander all served as Aldermen of the City. Joe Rosenbloom served as President of the Chamber of Commerce. At its largest, Congregation B’nai Israel had about 120 families. Over the years, children have moved away, people have retired to other places and the congregation decreased in size. Today, we are about 30 families, but we remain active as a Jewish community and within the larger Jackson community. The first president of the congregation was Julius Friedlob, who served from 1885-1901. He was followed by Victor J. Woener (1901-1916); Jacob C. Felsenthal (1916-1919); Joseph L. Rosenbloom, Sr. (1919-1941); Aaron S. Lindy (1941-1944); Sam D. Rosenbloom (1944-1945); Jonas Kisber, Sr. (1945-1948); Sam Bergel (1948-1950); Samuel Wahl (1950-1953); Julius M. Lindy (1953-1955); Irwin Freedman (1955-1958); George Axelrad (1958-1961); Joseph L. Cohen (1961-1964); David L. Richman (1964-1966); Jonas Kisber, Sr. (1966-1967); David S. Crane (1967-1970); Jonas Kisber, Jr. (1971-1973); Donald Friedman (1974-1975); Buddy Glassman (1976-1978); Gertrude S. Kisber (1979-1981); Harold Freedman (1982-1984); Jonas Kisber, Jr. (1985); Shirley K. Richman (1985-1988); Arthur Davidson (1989-1991); Jeffrey Stoltz (1991-1995); Herbert Davis (1995); S. Joel Newman (1995-2007), Mike Silver (2007-2015. David Cohen is the current president (2015-current). In 1903, Rabbi Louis Schreiber came to the congregation and he was followed by Rabbi Joseph Bogen, who remained in Jackson until his death in 1918. Student rabbis from Hebrew Union College served the congregation on a bi-weekly basis until 1933. Rabbi Alexander Kline served from 1933-1934 and was followed by Rabbi Samson Levey, who in turn was succeeded in 1939 by Rabbi Maurice Feuer. From 1958 to 1968, Rabbi Ernst Appel, a retired rabbi, lived in Jackson and served the congregation. Since the late 1960s, the congregation has been served by rabbinic students and part-time rabbis (Rabbi Margaret Meyer from 1999-2008; Rabbi Laura Schwartz Harari from 2008-2012; Rabbi Jordan Parr from 2012-2014). Rabbi-Cantor John M. Kaplan (Cantor Emeritus – Temple Israel, Memphis) is our current spiritual leader. 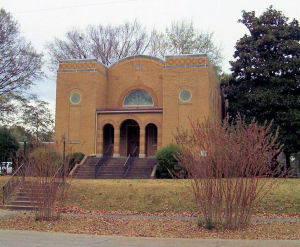 B’nai Israel has been a landmark of this historic neighborhood since the 1940s. The temple is important for both its history and architecture. It is one of the few properties in the state listed in the National Register for its significance in Jewish heritage. The Romanesque influenced design of the brick building is shown in the arched entry, the articulated walls with arched window openings, and the towers. The building has 25 beautiful stained glass windows designed by an artist who later went to work for the Laukhuff Glass Company of Memphis. Each sanctuary window is a memorial to a former member. (Click here for a detailed description of the stained glass windows.) 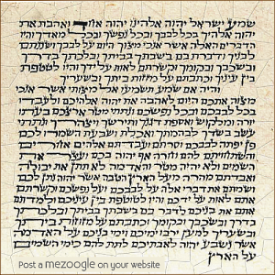 The temple has three Torahs of European origin that date from the 1800s. The two smaller Torahs were donated by Albert Jacob (A.J.) Altfeld and the larger Torah was donated by Philip and Mary Levy Marks. 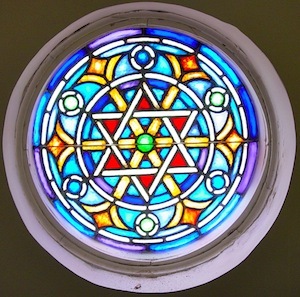 In 2014, with the unification of the Jewish Center of Union City and Congregation B’nai Israel, the Union City Jewish Center’s Torah was relocated to Congregation B’nai Israel. Also see the B’nai Israel congregational history in the Institute of Southern Jewish Life’s Encyclopedia of Southern Jewish Communities. See Pages 2 and 3 for Historical Records.